Santa Catalina Island, California often called Catalina or Catalina Island, is a rocky island off the coast of the U.S. state of California in the Gulf of Santa Catalina. 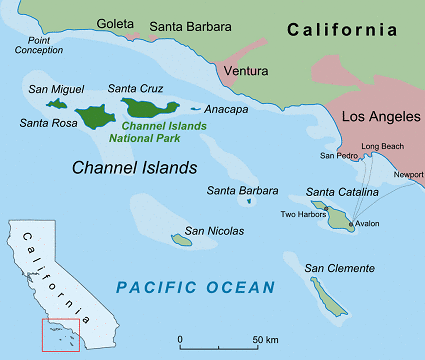 Santa Catalina is part of the Channel Islands of California archipelago and lies within Los Angeles County. There are very few people who actually live on the island, about 4096 according to the 2010 census. Most of those live in the only incorporated city, Avalon. The island is small, being only 22 miles (35 km) long and 8 miles (13 km) across at its greatest width. 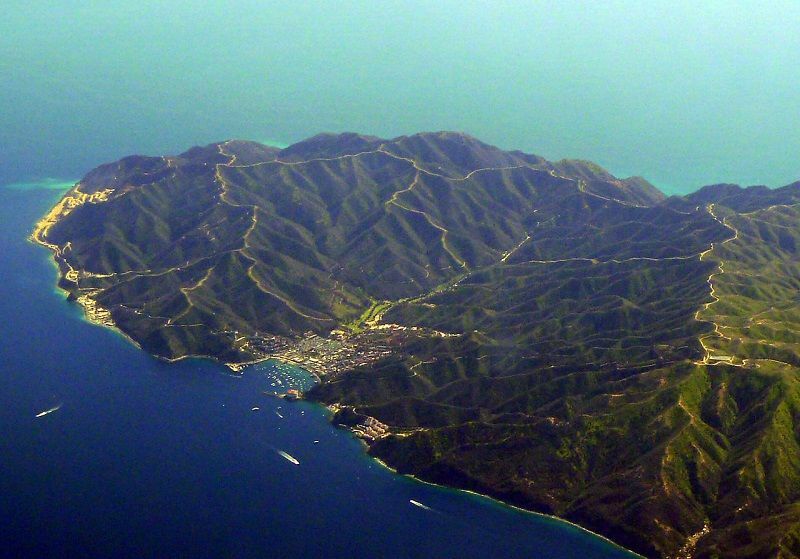 Catalina island is located about 22 miles (35 km) south-southwest of Los Angeles, California. Catalina island is a tourist destination developed by chewing gum magnate William Wrigley, Jr. beginning in the 1920s. There is a much smaller city on the island, the unincorporated village of Two Harbors. There is a very small remaining population scattered over the island between the two population centers. Catalina is a world unto itself. Although only a short distance from mainland California it is a distant asylum from the hustle and bustle of the rest of Southern California. Because the island is owned by the Catalina Conservancy its environment is protected. Many visitors to the island come from cruises offered by Carnival. 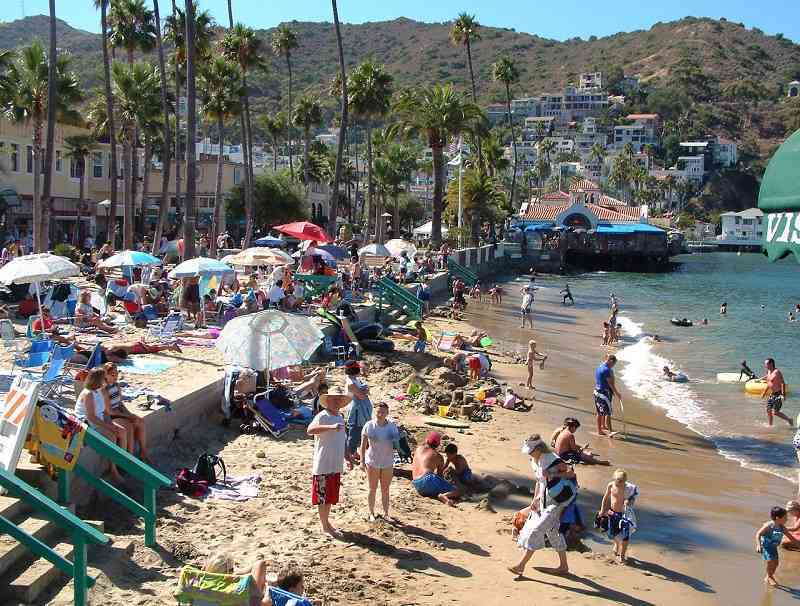 Santa Catalina Island has a very mild subtropical climate with warm temperatures year-round. Coastal high fog is common during summer, but usually burns off by the afternoon. The climate is typically mild and close to the same temperatures of the beach cities of Southern California of about 60 – 75 or 80F maximum in the summertime. A private nonprofit organization, the Catalina Island Conservancy, controls most of the island. 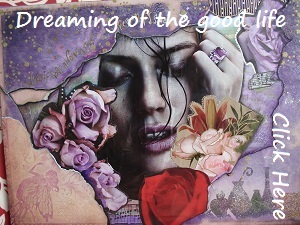 Their mission is to be a responsible steward of its lands through a balance of conservation, education and recreation. 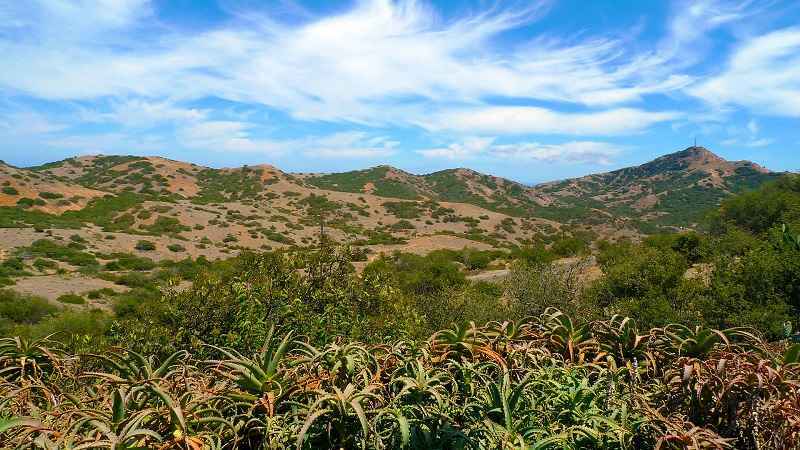 Through their ongoing efforts, the Conservancy protects the natural and cultural heritage of Catalina Island. They control approximately 42,000 acres (170 km2) of land (88 percent of the island), 50 mi (80 km) of shoreline, an airport, and over 200 miles of roads. The area is famous for the schools of flying fish and the bright orange Garibaldi which are abundant in local waters. Parasailing is also offered for those with the guts to try it. There are bus tours available which take you through the interior of the island. Although tourists rarely have an opportunity to surf, two beaches on the “backside” of Catalina offer good waves; Shark Harbor and Ben Weston Beach. There is also a place called Camp Emerald Bay on the north end of the island that offers summer camps for children and Boy Scouts. Catalina Island is a very popular tourist attraction with close to one million people traveling to Catalina Island every year. You can ride in glass bottom boats that tour the reefs and shipwrecks of the area. Scuba diving and snorkeling are popular in the clear water of the surrounding ocean. Lover’s Cove, to the east of town, and Descanso Beach, to the west of the Casino, are popular places to dive. The Avalon Underwater Dive Park was the first non-profit underwater park in the United States. Two Harbors is the second, much smaller resort village on the island. It is located at the isthmus of the island, north of Avalon and is the primary landing spot for people who wish to tour the western half of the island. It is accessible by boat from San Pedro and by bus or boat from Avalon. The Catalina Island Chamber of Commerce & Visitors Bureau assists tourists with any information on how to get to Catalina Island. You can get to Catalina by passenger ferries. Ferries depart from Orange County in Newport Beach and Dana Point as well as from Los Angeles County in Long Beach and San Pedro. I was just in Newport Beach last week and noted that the trip from there takes approximately an hour and costs approximately $70. Helicopter service is also available from Long Beach or San Pedro, two coastal cities in Southern California. Catalina has also been an active port of many cruise lines since the 1990s. Most residents move around via golf carts because the use of motor vehicles on the island is restricted. There is a limit on the number of registered cars. Most visitors to Catalina usually do their touring on foot. If you like to ride bicycling there are several bicycle rental agencies on the island or you may bring your own bicycle over with you. The Catalina Island Museum, located in the historic Catalina Casino building. There are no gambling facilities; the term casino refers instead to a more traditional Italian definition of casino, meaning social gathering place. The casino is also an attraction as it is the keeper of the island’s cultural heritage with collections numbering over 100,000 items and including over 7,000 years of Native American history. The museum features dynamic exhibits on this history and also a unique gift store. Programs include walking tours of Avalon, lectures, and more. Snorkeling and SCUBA diving are popular. Many dive boats depart from various ports in LA area, such as Long Beach and San Pedro, for a day diving trip to various parts of Catalina Island that are otherwise inaccessible via car from Catalina Island. The typical cost is $110–150 and includes breakfast, lunch, and three dives with air fills. Some boats have nitrox at additional cost. For those who don’t want to snorkel or dive, there are many alternatives to viewing the underwater life – semi-submarine ride and glass-bottom boat rides. There are interior trips that take you to see the Bison that make part of Catalina Island their home. There are also zip lines and Eco tours. If you like the outdoors and want to be really close to nature you might try camping. There are lots of camps and campgrounds on the island. If you are in Southern California and want to visit a popular island for tourist be sure to take a trip to Catalina. Most boat trips to the island leave from Long Beach, San Pedro, or Newport Beach areas. You’ll be visiting one of the few islands in the Pacific Ocean off of California that tourists can visit. Catalina island, Santa Catalina island. Bookmark.